Jonathan Wyner has over 40 years of running experience..well sort of. He ran his first race as an 11 year old and waited 27 years to run his next. In the interim, he played Ultimate Frisbee at the club level and had three kids before returning to running. Jonathan is a certified running coach (RRCA certified, also trained in CPR and First Aid), and coordinates the masters team for the Cambridge Sports Union, one of the Boston areas oldest running clubs. He participates in the club's 'coach by committee' philosophy and gleans wisdom from others with more than 20 years running experience of their own as well as by reading books by other noted trainers. "I think I come down in the Arthur Lydiard camp of training, believing in base and strength training to help runners gradually achieve their goals". Jonathan has 15 marathons to his credit. He has run the Boston marathon 8 times. His personal best time in a marathon is 2 hours and 50 minutes in the Cape Cod Marathon. Jonathan runs about 20 races in a year. He coaches runners who want to run competitively or just for fun. A passionate runner, he trains 40-50 miles a week on an average including two speed sessions a week, and one long run. Jonathan has degree in Music from Vassar College. He is owner and chief engineer of M Works Mastering Studios and he has been mastering and producing recordings for more than 20 years. He has worked with many a world famous artists. Sanjay Ram is not sure why he started running in his teens for a few years on a beach in Mumbai… and picked it up again after a hiatus of several years at the age of 28. He caught the ‘running bug’ again during his Infectious Diseases fellowship training at Boston University. He was a member of the Cambridge Running Club for several years and is now a member of the Central Mass Striders after moving to UMass, Worcester. Sanjay has run 16 marathons, including Boston, New York, Chicago, Dublin and Beijing. 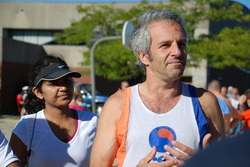 He has run 3 marathons (Chicago, Marine Corps and Twin Cities) with members of ASHA-Silicon Valley that is coached by his cousin, Rajeev Char. Sanjay’s personal best is 3:13 at Portland, Maine. He tries to get in 30 to 40 miles a week and a key part of his training philosophy is to try and stay injury-free by incorporating strength training. Sanjay looks forward to training with TeamAIDAsha and hopes to run a marathon on all continents.